Life on The Scrap Heap: Paper Smooches January Guest Designer! Hope you have all had a fantabulous Christmas! It's been a while since I wrote a post or even made a card. We spent Christmas on the beach in Tasmania. A very different Christmas experience for us all - a barbecue lunch with freshly caught fish, fresh prawns, beautiful wine, lots of presents (somehow Santa found the kids), good friends, did I say wine? It was a really wonderful way to spend Christmas. Just before I left, I received an email from Kim over at Paper Smooches Stamps, telling me I was January's Guest Designer! A lovely surprise and I came home to some gorgeous happy mail which I've been playing with ever since. She has some great new products in store so check them out here. 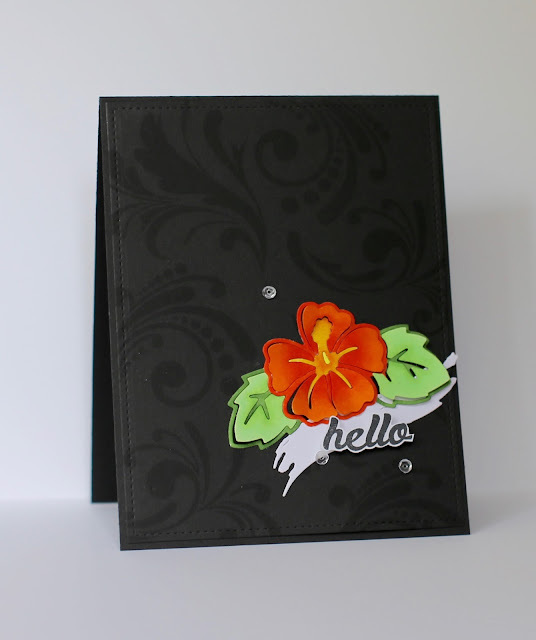 I used the brand new Hibiscus Die as my focal point. I coloured it with Copics and curved the leaves and petals up a little to add some dimension. It's resting on a die cut paint stroke from Paint Strokes Dies and the sentiment is from the Silver and Gold stamp set. For the background I randomly stamped a variety of flourishes from Curls and Swirls in Versamark. Love this stamp set! Somehow all the flourishes fit in with each other so you don't have to spend half an hour working out where to place them all...or is it only me who does that? Well, first card down and a few more to go. I'll back back next Wednesday with another! Congrats, Claire and Happy New Year! And what a wonderful card - the colours really pop against the black!